Pesto Sauce Recipe - a unique low glycemic pesto sauce! This may be the most unique pesto sauce recipe you have ever run across because it is not only delicious, it will help you to burn fat! This recipe was given to me by one of my clients who is losing a lot of weight gradually but permanently with our low glycemic "clean eating" plan. I have tweaked the recipe a little bit. It’s a cilantro pesto sauce made with flaxseed oil, which is the best source of essential fatty acids. Essential fatty acids increase metabolism and thus your energy production making it easier for you to burn fat. What about the taste? Fantastic! Cilantro has a milder, yet very distinct flavor that is quite different from basil and makes for a very interesting pesto recipe. It's quite flavorsome and more versatile. Since it’s not as strong tasting as basil pesto you really can eat it every day in lots of different ways. Place your seeds, nuts, garlic cloves, salt and half the flaxseed oil in your blender and blend. Add each of the rest of the ingredients 1/4 cup at a time and blend each time until all is thoroughly mixed. You will need to scrape the sides of the blender and start out on your lowest mix setting but gradually go up to the highest. It will be a coarse texture but green and roughly smooth. You can make your favorite pasta and just put a dollop of pesto on top for a low glycemic dinner or lunch. Remember pasta is low glycemic. Use the yellow Barilla high protein pasta or a whole grain one to get the lowest glycemic index. Cook the pasta according to the directions on the box and put on the pesto. Toss and serve. You can also have it on whole grain crackers, on a sandwich (with sprouted grain bread) or in scrambled eggs. It will spice up any grain dish, bulgur or barley or even as a pesto sauce recipe for chicken. In order to increase your metabolism you would need to eat three tablespoons of flaxseed oil a day which is not hard to do with cilantro pesto. I can put that much on two crackers. If you eat this with your favorite salad or a few raw veggies, a glass of almond or soy milk and some fruit you have a very nice light lunch or low glycemic snack. This much flaxseed oil will help you to burn fat and glucose. It is therapeutic for diabetes, fat loss, obesity, heart disease, high cholesterol and more. This is a pesto recipe that is a nutritional power house. It not only has an abundance of flaxseeds but also walnuts (for brain support,) pumpkin seeds, and sunflower seeds for even more essential fatty acids and loads of fiber. All the ingredients are exceedingly health promoting so not only does it taste delicious but it will improve your digestion and support your natural immunity. Cilantro supports good colon health and is a natural detoxifier as is garlic. Garlic is “nature’s antibiotic” and is known for killing fungi, bacteria and parasites. This pesto sauce recipe will add a lot of zest to your low glycemic eating plan for all the reasons above. I love that it's so nutritional, burns fat and is filled to the brim with essential fatty acids. It's a fabulous way to get more flaxseed oil into your life. I can’t think of another food that is as rich and does as much good. Return from Pesto Sauce Recipe to Low Glycemic Recipes. 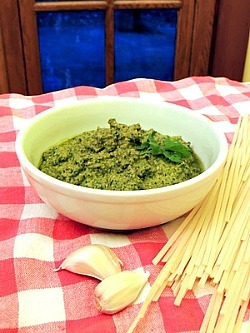 Return from Pesto Sauce Recipe to Lifetime Fat Loss home page.